The Chevy Tahoe is a powerful and splendid SUV with a luxury ride that smoothes the bumps and dimples in the road. The New Chevy Tahoe Hybrid is reported to go as many as 21 miles per gallon of gas in city driving conditions (for the 2WD model), which is 50 percent better than what the same model with an ordinary 5.3-liter V8 powerplant may achieve. The numbers will not be equally impressive on the highway though, being 22mpg and 20mpg respectively. The Chevy Tahoe Hybrid boasts a spacious and luxurious interior, along with a vast array of features. Honestly it's like strapping yourself into your favorite reclining chair. 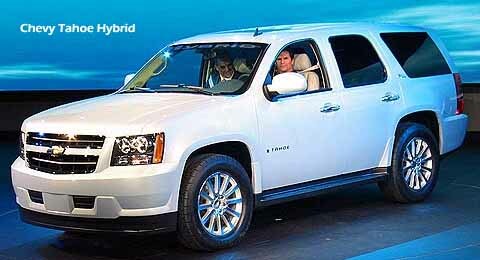 The Chevy Tahoe Hybrid can also accommodate up to nine passengers comfortably. For families and teams who need a spacious, comfortable and rugged full-size SUV, Chevrolet's full-size entries have long been and are still considered to be the go-to vehicles. With their stout, truck-based underpinnings, these vehicles are also ideal for towing and off-roading duties. Side-curtain air bags and a camera to see what's behind when backing up cover all the safety bases. Well-cushioned seats, controls at your fingertips and flip-and-fold second-row seats provide a wide aisle to the third row. At least the seat backs fold flat to provide cargo room even if it costs you a couple passengers. Chevy Tahoe really stands out with its dual-mode hybrid power.